Binding is both decorative and protective. Many makers and manufactures will use binding made of plastic, wood or other materials to accent the edges of the top, back, fingerboard and peghead. The celluloid binding found on many vintage instruments can start to deteriorate and crumble with age, taking on the appearance of a crazed puzzle. When replacing binding on vintage instruments, the new binding is aged to make the repair less detectable. New binding is aged to look appropriate. Rebinding an instrument that is not going to be refinished is delicate and time consuming. Once the original binding has been removed the channel is cleared and prepped for new binding. The adhesives used to adhere binding to channels is very harmful to finishes and as a result great care must be taken to protect the finish. In most applications the new binding must be scraped to ensure it is level with surrounding panels with no apparent edge. Stains are then used to simulate aging. 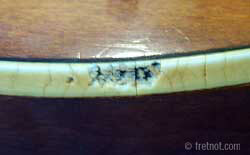 Because loose binding is very vulnerable to damage it should be repaired as soon as possible. Adhesives used to glue binding are harmful to the finish and the instrument must be properly protected before repairs begin. Repairing loose binding as soon as it is noticed will save money in the long run as new binding does not need to be glued, scraped and refinished to blend with the original. Complete rebinding of mandolins is usually reserved for high end, valuable instruments as the cost to rebind an entire mandolin would quickly exceed the replacement cost of an inexpensive instrument.